The CDC’s Yellow Book is an indispensable reference for providers whose patients travel internationally. 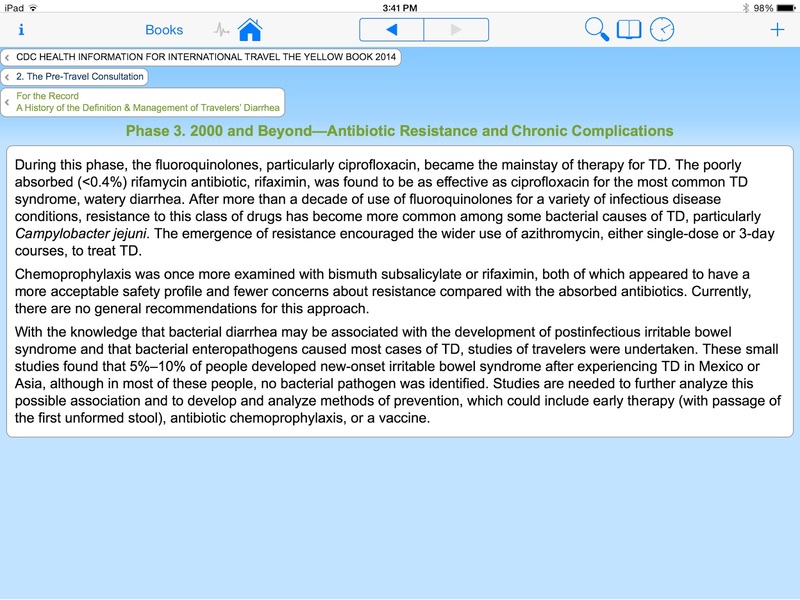 The 2014 version is available for free onlineand now in app form as well. In a change from its other apps, the Yellow Book is produced by MedHand Mobile Libraries for Android and iOS devices. In general, we’ve been impressed with the CDC’s apps in the past, such as their Vaccine Schedules app and the general CDC news app. Unfortunately, this app offers little benefit from using the online version on mobile browsers, and certainly nothing that justifies its $9.99 price to unlock the full version. Most primary care providers are no strangers to travel health questions. While possibly far from pediatrician’s minds during these back-to-school days, winter vacation will be here soon enough, to say nothing of children coming home from international travel with diffuse symptoms. Do these fevers and muscle aches represent Chikungunya? Should this child traveling to Burkina Faso receive any vaccinations? 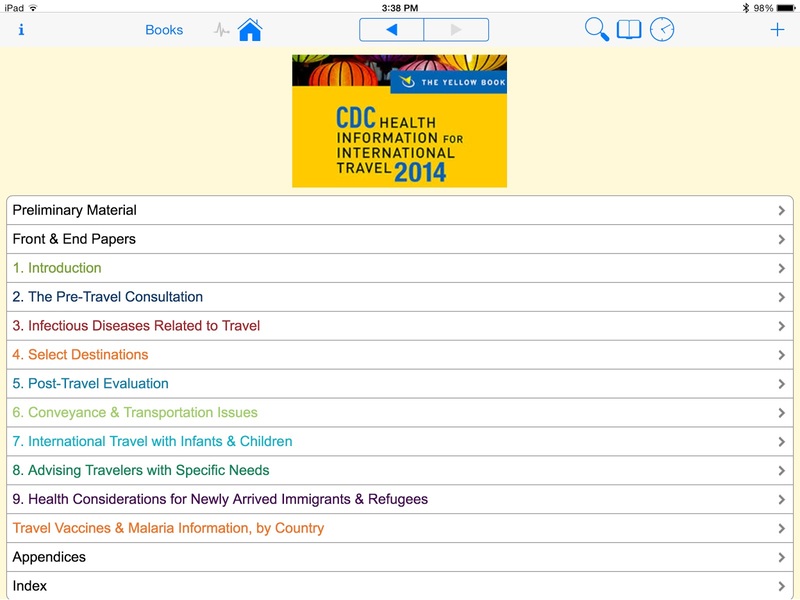 The CDC’s Yellow Book, published every two years, has thorough country and disease-specific recommendations for travel and an easy-to-use website, making it a terrific resource for travel medicine and primary care providers. Given how useful and user-friendly the CDC’s website is, the mobile app version has a high bar to clear to shift use to the app — unfortunately, it falls short. The app opens to a homepage with the table of contents. The free version includes a small amount of content. The unlocked version contains the larger table of contents along with the country specific information and an index, both of which are missing in the free version. The full version of the app has all the content of the Yellow Book website. Selecting a chapter brings you to the chapter’s individual table of contents, and selecting the subchapter brings up that section. You can not swipe through different subchapters but you can swipe back and forth in terms of your recent visited sections. Each section also contains links in the upper left hand corner, permitting users to jump back to the app’s main page or the chapter main page. The sections can be text-heavy, with occasional tables and images. 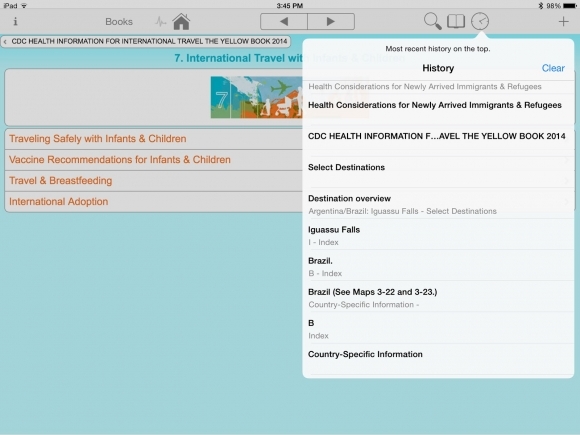 The paid version of the app also includes country-specific vaccine and malaria information, divided by country. In some countries, where recommendations for prophylaxis and vaccination may vary internally by locale, there are included maps. Unfortunately, the map data cannot not be opened in other mapping apps, such as Google Maps, but the map image can be copied and pasted elsewhere. The full version also includes information on international adoptees, post-travel evalution, and international travel with infants and children. The full version also permits bookmarking specific pages, includes a more complete search function, and retains a history of recently visited sections. 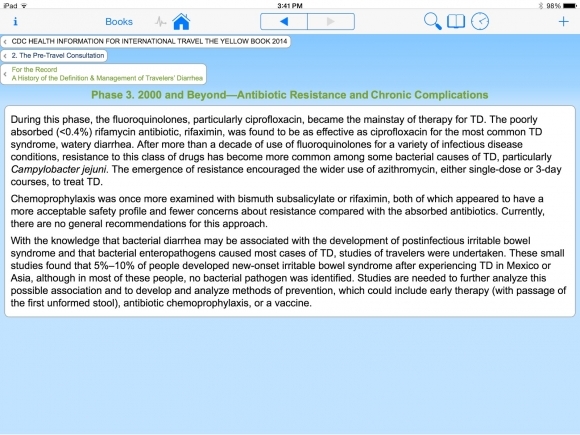 The app is based on the content from the Yellow Book which is published by the CDC. It also includes references, although links are only provided sparingly and cannot be opened within the app. Travel medicine providers, primary care providers (MDs and NPs) who deal with patients and families who travel. Travelers who want health information, parents adopting children internationally. 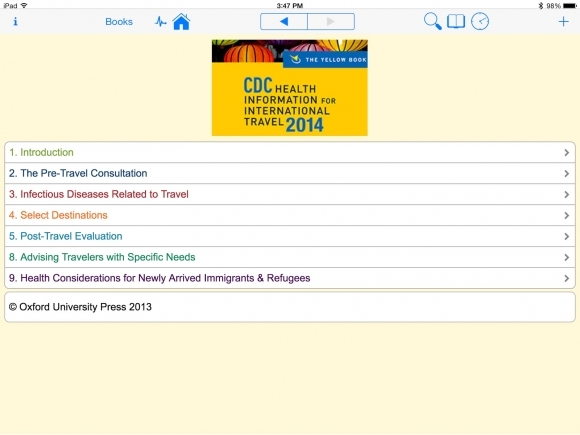 The Yellow Book app has the terrific content of the CDC’s indispensable travel guide; in a departure from other CDC apps, it is over-priced and poorlydesigned. Given the app’s limitations, it is hard not to recommend accessing the Yellow Book’s content on your mobile device’s browser of choice rather than shelling out $9.99 for the app. Even though the website is not optimized for mobile, there is not nearly enough benefit for the app to justify its price point.